The gates to the car park close at Sunset, be careful you don’t get locked in. There is a tunnel under The Grove Way allowing access to both sides of the park by bike (refer map). Park information also available from DEWNR web site Cobbler Creek Recreation Park. Car Parking: Yes, parking is available at the main entrance at the corner of Bridge Rd and Smith Rd, Salisbury East. Gate is closed at Sunset, be careful you don’t get locked in. Cobbler Creek Recreation Park is located approximately 19 km north east of Adelaide between Salisbury and Golden Grove. The main entrance is at the corner of Bridge Rd and Smith Rd, Salisbury East. The park can be accessed by bike via entrances on all sides of the park. Train transport: The park is not accessible by train. 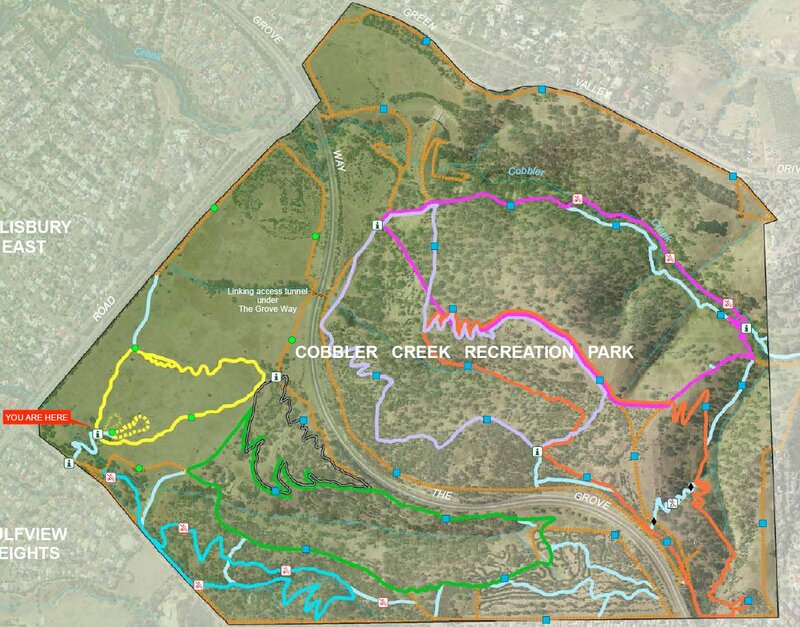 Cobbler Creek Recreation Park is in the Adelaide Metropolitan Fire ban district. The park may be closed on days of declared Total Fire Ban for the Adelaide Metropolitan fire district. Web site: Refer DEWNR web site Cobbler Creek Recreation Park. Here’s a great article on the Cobblers Creek trails by Jase at Ride More Bikes.